Our farm has been in operation since 1991, and we’ve been working at producing the best quality oysters that we can. We’ve tried a bunch of different methods for growing, not all of which were successful. What it comes down to is frequent maintenance and plenty of growing room to ensure happy, healthy, uniform oysters. That’s why we’re constantly working to keep our oysters looking and tasting their best. Every single oyster is inspected throughout the growing season and hand-bagged before going to market. This constant handling ensures a high quality and a good cup depth without the need for tumbling, and they get to market weeks or months ahead of our competitors. We have over 7 acres in 2 distinct growing areas, giving us two distinct oysters. 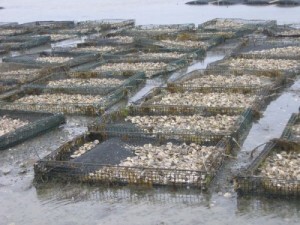 Our Sandy Necks are grown in cages and bags on the north side of the Cape, in Barnstable Harbor. Our Garrison Point oysters are grown right on the bottom in Osterville’s West Bay. Check out the differences on our “Products & Services” page. We are a licensed wholesale dealer, and our state-certified processing facility follows a HACCP plan to ensure compliance with all regulations and minimize any risk to our consumers. We sell to wholesalers, restaurants and direct retail, as well as offering raw bars for special events. Contact us if you are interested!